4.0-4.9: Generally cards designed specifically for Constructed that simply don’t gel in Limited, ie specific hate cards. Archangel of Tithes is undoubtedly a bomb. A four mana 3/5 with flying that has not one, but two relevant abilities is the type of card you want to be first picking. This angel is stellar on both offense and defense. Unfortunately, the triple white in its mana cost means that it will be hard to cast, and if you run it, you’re going to need to be almost mono white if you want to be hitting this card on turn four. Even if you don’t, this card is good later in the game. Well it won’t exactly dig you out of a hole, it definitely helps. 2/1’s for a single mana are always nice to have. 2/1’s that also transform into powerful Planeswalkers are significantly better. 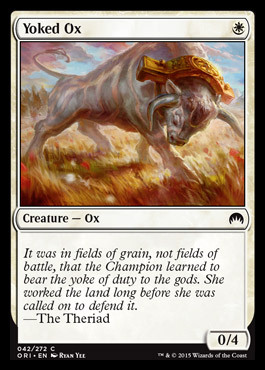 The problem here is that, in order to become Gideon, Kytheon will need to survive combat – usually on turn three or four. The activated ability helps, and once he turns into a Planeswalker, he’s an absolute bomb. Kytheon is definitely a card that is worthy of being first picked, but not necessarily a reason to move into white, and this is definitely not the type of card that will bring you back from a losing position. In spite of this, his strength in the early game and in a board stall makes him nearly irresistible. Starfield of Nyx is hot trash. Unless, of course, you first pick it and build a deck around it. Now, this doesn’t necessarily mean that it will be a bomb if you build around it, and it’s not enough to justify picking a bunch of worthless enchantments. Perhaps the biggest problem with Starfield of Nyx is that it has almost zero impact on the board when it comes down. This is not exactly the type of card you want to build around specifically, but it’s the kind of card that will be fun to mess around with later in the format. Eight power for seven mana at Instant speed is kind of ahead of the curve, and the fact that it’s spread amongst four creatures will occasionally make it an even better deal. Spot removal doesn’t exactly work well against this card, and four 2/2’s are relevant at any stage of the game. Plus, the Spell Mastery ability allows you to cast this during combat, and then single, double, triple, or even quadruple block with no consequence. Unfortunately, casting Gideon’s Phalanx at instant speed requires seven mana being left open, which can be difficult. Still, casting this at Sorcery speed is still pretty good, and Gideon’s Phalanx is a card you’ll be actively looking for if you’re in White. Hallowed Moonlight is a solid hate card in Constructed, but it’s a purely sideboard card in Limited. Occasionally you’ll see a card in an opponent’s deck that allows them to put creatures or tokens onto the battlefield without casting them, and this is an easy way to deal with it. Unfortunately, it’s only a one time effect, however, it does cantrip. If it weren’t for the cantrip it would be hard to justify bringing this card in to deal with a small number of cards in your opponent’s deck, but two mana to cycle is not exactly a bad deal. As a 4/4 for five with flash, Hixus is a great defensive creature. What makes him even better as a defensive creature is the fact that he can act as an O-Ring type effect. Unfortunately, in order for this ability to work, you have to take damage. But, if you can survive the hit, Hixus can act as a pseudo board wipe. This is, of course, best case scenario, but worst case scenario you’re getting a 4/4 for five that you can cast pretty much at any time, and there’s nothing wrong with that. 2/2’s for two aren’t bad. Nor are 2/2’s for two that have some form of evasion, first strike, in the case of Knight of the White Orchid. Even with the double white in its mana cost, this creature is actually still pretty good, especially since it will occasionally get you a land. This card is best if played on turn two, but it isn’t bad on turn three or four. It’s probably not a first pick, but white decks should be happy running this card. Kytheon’s Irregulars is a fairly aggressively casted card. A four mana 4/3 on its own is actually pretty good, and is the type of white creature that most white decks would run and be at least slightly happy with. A 4/3 that can also tap creatures (without tapping himself!) that can become a 5/4 is GREAT. Tapping opposing creatures has a great synergy with the Renown mechanic, and it can either be used to force chump blocks or ensure that Kytheon’s Irregulars gets its +1/+1 counter. This is the kind of card that can do work at any stage in the game. So Relic Seeker is kind of a fixed Stoneforge Mystic, isn’t he? Unfortunately, that means he’s mostly geared for Constructed. The equipment in this set isn’t that great, so tutoring for a piece of it won’t necessarily be all that helpful. Now, unlike Stoneforge Mystic, Relic Seeker is a 2/2, potentially a 3/3, and no one can complain about a 3/3 for 2, and even a bear is fine for most white decks. This isn’t the type of card you’ll want to first pick, but it is the type of card that will nicely fill out white decks, even if they’re running no equipment. This is the only card that cares about an Enchantment that makes the Enchantment deck worth pursuing. It gives all of your Enchantments massive value, even the ones that aren’t great. It may not impact the board immediately, but with enough Enchantments, it will. Unfortunately, the high variability of the card makes it a bit tough to justify playing. The part about Tragic Arrogance that puts it over the top is that it allows you to choose the permanents that get sacrificed, getting past the classic Edict problem. Most of the time, you’ll just be taking out a bunch of creatures, but it is possible that you’ll get some Artifacts and Enchantments as well. If your opponent has more than one Planeswalker against you in Limited, you may have bigger issues to worry about. This being a Sorcery is a bummer, but it still seems like solid removal to me. Vryn Wingmate is very obviously geared towards Constructed play. It’s ability is definitely not designed for limited, and its stats don’t really justify the mana cost. It can put a tax on your opponent, but it simply isn’t the type of card you want in a Limited deck. Anointer of Champions is the kind of card that can make combat hell for opponents, but, as with all onboard tricks, is really easy to play around. You’re rarely going to “get” someone with her, but she’s still the type of card you can be content with playing. Blessed Spirits is an uncommon that you should be happy about running. The upside on it is marginal, but it’s hard to imagine that you won’t be running a few enchantments in a white deck. Though they may not always hit the battlefield at the same time, the synergy is still excellent. And, even if you aren’t running any enchantments, a 2/2 flier is nothing to complain about, even if it isn’t the best card in the format. Consul’s Lieutenant will usually put your opponent in a very awkward position when it comes to combat, if you can hit it on turn two or three. They’ll either be forced to block unfavorably, or deal with a 3/2 First Striker that pumps your entire team on the attack. Most of the time, they’ll try to deal with as quickly as possible, though unfortunately for them, they’ll most likely be losing one of their creatures in the process. In spite of its high mana cost, Knightly Valor will still provide a good deal of value. Of course, it comes with the usual drawback of being an Aura. However, if you can land this card, the token it gives you means that a removal spell isn’t exactly a 2-for-1. Plus, it gives a fairly significant pump to one of your creatures, so as long as it has a target, Knightly Valor can put in some solid work. Murder Investigation is hard to evaluate because of its potentially high upside. It acts as insurance for your largest creatures, but until that creature dies, this card does nothing. In addition, it could potentially do nothing for the entire game, in which case you wasted two mana. I would be willing to say that. most of the time, Patron of the Valiant will be a 4/4 flier for five. Which is fine. Actually, it’s better than fine. At times, however, it will synergize with Renown or other abilities that place +1/+1 counters on creatures, and buff up your entire team. This ability reeks of “win-more,” but even on its own Patron of the Valiant is nothing to laugh at. Sentinel of the Eternal Watch is a fairly high pick that’s great at all stages of the game. The fact that it will immediately start tapping down opponent’s creatures is awesome. Unfortunately, Sentinel’s tapping is more defensive, and lacks the flexibility of activations whenever you want. Still, the creature will stay tapped during your turn, so with a little bit of planning this card can play a nice role on the offense. Oh, and did I mention that it’s a 4/6 with Vigilance? This is pretty much White’s premiere removal spell, and it’s not half bad. It’s essentially a two mana Assassinate, but with the possible upside of it being an Instant. This is definitely a card that white decks will be going after. My biggest gripe with this guy is not that it’s a 2/5 for five, rather, that there aren’t enough truly excellent Auras in this set to search up with his ETB ability. This guy is a role player in a fairly weak archetype, and should not be prioritized in Draft. While Valor in Akros may seem to be a good card, taking a turn off to cast it puts you behind. I wouldn’t go so far as to say that it’s unplayable, it’s just not very good. The downside on this card (which is it literally doing nothing) outweighs the potential upside. It’s very much a “win-more” card – if you’re ahead, this will speed up the game, but in a board stall or if you’re behind, the impact it has on the board may not be enough. 3/3’s with Lifelink, even at four mana, are nothing to scoff at. The fact that War Oracle has Renown makes it even better. This is definitely one of White’s better uncommons, and possibly the best White uncommon in the set. You get great value for your mana, and it’s a solid creature at any stage of the game, even when you’re behind and won’t necessarily be able to get Renown to trigger. You typically don’t want to play 1/1’s for one, even if they have upside. Regardless, tappers are generally pretty good against certain decks, making this hard to evaluate. He’s not terrible, but he’s not all that good either. This card is playable, but that doesn’t necessarily mean you have to be happy playing it. 3/3’s for four with upside are generally pretty great, and Ampryn Tactician is no exception. If you have no other creatures, despite its ETB ability being functionally useless, it’s still not bad as a 3/3, though you will be losing value. Since there does seem to be something of an Enchantment theme going on in Origins, Auramancer can generate a good deal of value in the right deck. Unfortunately, the enchantment deck doesn’t seem to have a great selection of enchantments. You’ll get value, sure, but it’s more likely that you’ll just play Auramancer as a 2/2 for three in a white deck when you don’t have anything better to run. Aven Battle Priest is way overcosted for what it is. I wouldn’t be surprised to end up playing with/against it, especially in Sealed. That said, a 6 mana 3/3 flier with very marginal upside is not great. It fits in the Skies deck that will inevitably arise, but it’s not a key component of it, nor is it a card that will be prioritized. Celestial Flare is an iffy removal spell. Not only is it an Edict effect (so your opponent chooses the creature they sacrifice), but it only removes a creature during combat. It’s much better on defense, since you can bait their biggest creature into blocking alone if you try hard enough. On the attack, it has the potential to shut down an offense, but most of the time it will just save you 1-2 points of damage. Charging Griffin is a very aggressive card, one that encourages attacking. On the attack, it’s going to be a 3/3 flier, which, for four mana, is nothing to scoff at. Unfortunately, it’s really only good when you’re being aggressive. Otherwise, it’s not all that great. Functionally, this card is going to just be a bear, which is fine. Even when you get a lifegain trigger or two, it still isn’t much better than a bear, as lifegain should not be a priority in Limited, barring game winning synergies. It’s not a card anyone will be excited about playing, but at the same time, no one will be actively avoiding playing it. I’ve said (and will say) that 1/1 for one’s are generally bad. There are a few that I’ve defended in these reviews, but what I will not defend is a 1/1 for two with a laughable upside. I guess if you hit someone playing an Enchantment deck then this will be fine, but there are very few Enchantments that actually warrant bringing this guy in from the sideboard. Enshrouding Mist is a combat trick that doubles as a protection spell. It can save your creature from potentially lethal combat, and make that creature more likely to take out an opposing creature, and all of this for just one mana. Enshrouding Mist is not the best combat trick, but it’s a nice one to have around in certain scenarios. The part of this Aura that makes it good is not the +1/+1 buff it gives your creature, it’s actually the ability to tap your opponent’s creatures on the offense. It can clear the way for an alpha strike, allowing you to break through a particularly potent creature. That said, it is still an Aura, and comes with that particular card type’s standard drawbacks. Heavy Infantry is pretty decent. It’s not the top of card people will be excited to play – 3/4’s for five generally aren’t that good. However, it has an ETB effect that isn’t horrible. That said, it’s not great either. If you have no other creatures, Heavy Infantry doesn’t do much. Its tap ability isn’t even that great defensively, as the creature will just untap as normal. While people will probably play this card, in most scenarios they will do so begrudgingly. Knight of the Pilgrim’s Road is decent as either a 3/2 or 4/3 for three. Neither scenario is much of a bargain, mana wise, but neither scenario feels like it’s off curve. All in all, Knight of the Pilgrim’s Road is a solid common in most decks. Kytheon’s Tactics is a card that’s good enough to see play, but not quite good enough to be worth picking up early in a draft. You’ll almost always run this in Sealed, but in Draft it’s a bit more of a toss up, depending on your card pool. This is especially true because there are conceivable occasions where this card is just 100% dead. Mighty Leap is a classic combat trick. It’s been around for a while, and it’s always been pretty good. It’s far from the worst combat trick ever printed. In fact, it’s a pretty good combat trick. Maybe not the best, but definitely highly playable. Fliers with Renown (or any type of evasion) are going to prove to be very good, as the Renown is essentially guaranteed, so Stalwart Aven has that going for it. And, to be honest, any two power flier with at least two toughness for three mana is going to be pretty good. The bonus toughness on this guy just makes him harder to kill. The major downside is that if you can’t break through, you spent three mana on a 1/3 which, flying or not, isn’t optimal. At four mana, Suppression Bonds is more expensive than Oblivion Ring, for an inferior effect. Removal has certainly been downgraded of late, so this isn’t necessarily a surprise, especially at Common. If you need removal, Suppression Bonds is far from the worst option, and I’d definitely say to go for it if necessary. Vigilance has a great synergy with Renown, allowing players to take advantage of the +1/+1 counter on the very next combat step. Topan Freeblade is a bear with very high upside. Best case scenario you’re getting a 3/3 with Vigilance for just two mana, and worst case scenario you’re getting a vigilant bear. There’s no real downside to playing the card, and it may emerge as one of the premiere commons in the set. There’s not much to say about a 0/4 for a single mana. It’s pretty good if you want to gum up the ground, otherwise, this isn’t the card for you.